In this post we will see how we can build Multi Node Docker Swarm Cluster on Oracle Cloud Infrastructure Classic. To Start, we will create Three Nodes in the Swarm Cluster with One Nodes as Manager and other two nodes as Worker Nodes. Any Number of nodes can be added in the same fashion to scale the cluster. For three node Cluster, we will create Three Compute Classic Instances. We will use Ubuntu Image for all the nodes of our Swarm Cluster. It is very important to have correct Ingress Firewall Ports Open on Manager & Worker Nodes in order to have right communication between Manager & Worker Nodes in the Swarm Cluster. Below is the table of the Ports which needs to opened on Managers & Workers. Thanks to Bret Fisher for this awesome information. 1) In OCIC we will need to create Security Applications. Below is screenshot for Four Security Application along with Port Numbers. swarm-sec-list is attached to all the Nodes, this provides security rules - ssh and http/https or any port which needs to be accessed from Public Internet. 4) Next step is to create Compute Classic Instances. Below are the Three Nodes Created on Compute Classic. For this example we used Shared Network, You can also use IP Networks for the same. Node1 is Manager Node with Security Lists swarm-manager-seclist and swarm-seclist. We are all good with OCIC. Now that we have all Nodes created/provisioned, First Step is to Install Docker on these nodes. This is the best way to install latest CE Stable build of docker so that you get all the latest features of Docker. You can install it other way also. Completely up to you. Below is what the instructions on get.docker.com. After that run  $./get-docker.sh and this script will install Docker Latest Stable build on the Node. Exit and Login again using ubuntu user. You are all set to Fire Docker CLI Commands and create/manage Containers. To initialize Swarm, Execute the below command. The Command output shows that Current Node - node1 is now a Manager in the Swarm. The Commands also returns a command docker swarm join --token <token> which needs to be run on worker nodes so that they can join this Manager node and create a Manager Worker Nodes Swarm Cluster. You can run below command on this Node to get the tokens. $docker swarm join-token manager -- Returns command that can run on other nodes to join as Swarm Manager in Addition of Current node. 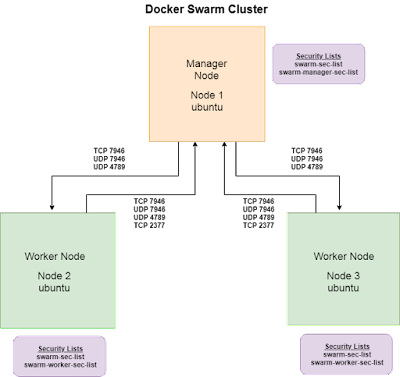 $docker swarm join-token worker -- Returns command that can run on other nodes to join Swarm Worker to the Manager Node. That's it. Swarm Cluster is Configured now - Node1 as Manager and Node2 & Node3 as Workers. To Check if everything is good Run below Command on Node1 - Manager Node. Manager Status as Leader means this Node is Manager. Blank Means this node is worker. We are all set now. Lets try to create a Service and SCALE it all the nodes. rohanwalia/node-web-app is docker image in my dockerhub. It is a simple Hello World NodeJS Application which exposes port 3000 on http. Service demo_web is created and scaled on all three nodes. We can check the status by running below command. Not we can grab Public IP Address of any Node and open it in Browser. The service can scaled using below command. Below we Scaled down to 2 Replicas. Let us quickly check the Status Again. This shows that Service is now deployed on Node1 & Node 3. We have successfully Created a Multi Node Swarm Cluster which we can Scale Out to add more nodes. And we have also created a service and scaled our Service to Swarm Cluster Nodes. Do let me know if you have any questions or comments on this post. Great work with screen shots to simplify the whole process. Thanks Maha!! Glad it was helpful for you.